If you use Scheduled Tasks, you probably want to know when they fail. 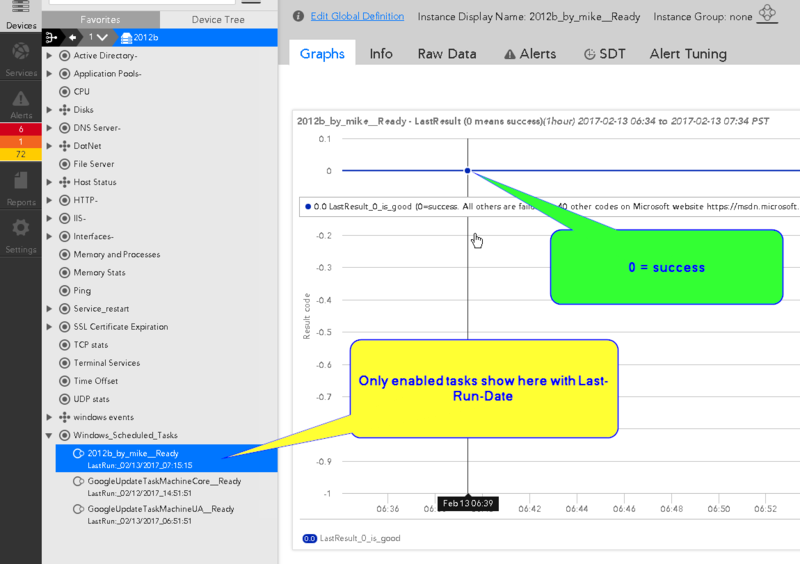 This DataSource uses PowerShell to show all your enabled scheduled tasks and the LastResult code. 0 (zero) means success. Believe it or not, there are ~40 other codes. Microsoft, it it’s infinite wisdom lists them here in hexadecimal but PowerShell shows them as decimal. I will attach the most common conversions. I took advantage of the Discovery Filter feature of LogicMonitor to exclude the typical ~50 that Microsoft includes on most Windows computers and 2 with “Optimize Start Menu” in the name. Test by making sure expected values show in “Raw Data” tab. Disclaimer: LogicMonitor tech support cannot officially provide support for this DataSource.